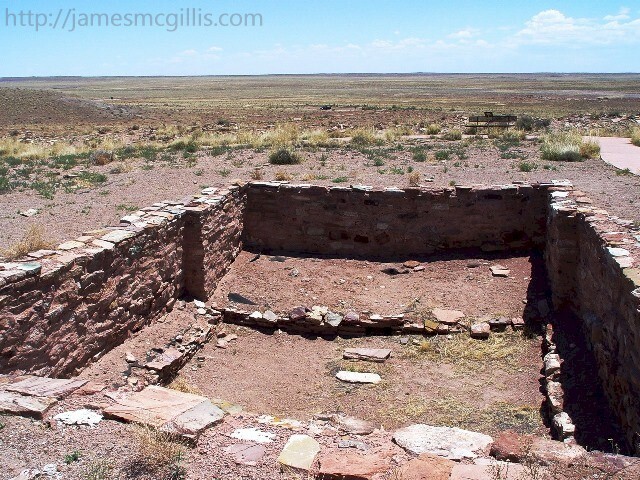 In May 2008, when I first visited Homolovi Ruins State Park near Winslow, Arizona I enjoyed it for what it lacked. There was no visible water, only a few parched trees and an RV campground with few amenities. With water and electricity brought in from underground to each campsite, the place was more pleasant than it first appeared. In the heat of the day, I could retreat into my air-conditioned coach to read or watch the old analog television signal that emanated from a tower in the nearby town. 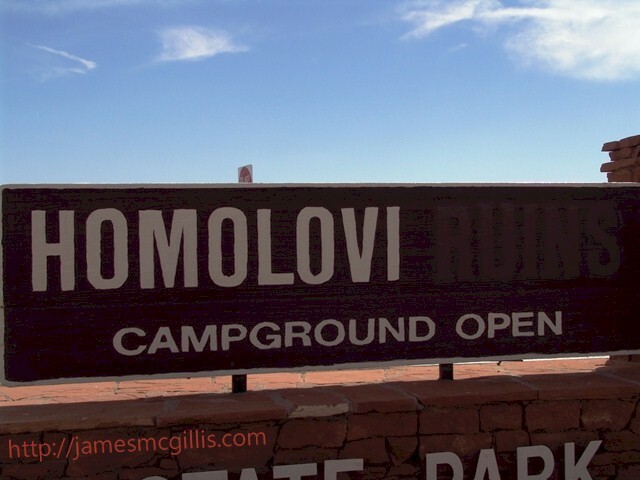 Developed decades ago as a unit of the Arizona State Park System, Homolovi seemed teetering on the brink of extinction. Rangers no longer staffed the entry booth, although a campground host did arrive to collect my money and answer my questions. Few of the campsites had occupants during my stay, yet I loved the place for its solitude and lack of activity. Later, in 2010, the park did close for a time. 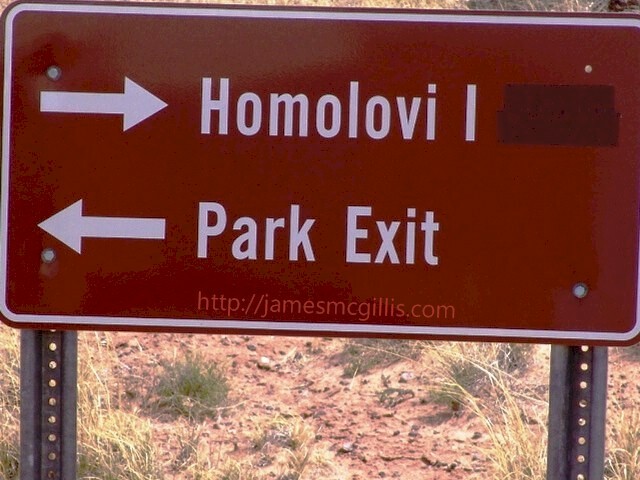 As a metal sign indicated, only half a mile from the campground was “Homolovi Ruin I”. Throughout the southwest, travelers often see the remains of grand edifices created by the ancient tribes we call the Anasazi or pre-Puebloan. 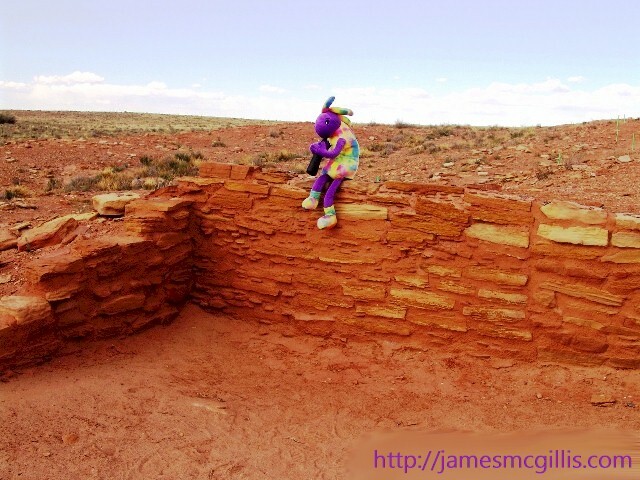 Unlike the great Kivas of Chaco Canyon, New Mexico or the Twin Towers at Hovenweep National Monument, Utah, only a few foundations of a once-great civilization survive as the “ruins” at Homolovi. What destroyed the great buildings of Homolovi was water, rushing in the desert. Early in the Second Millennium CE, the Great Disappearance took place throughout the northern reaches of the Colorado Plateau. Most scientists agree that the ancient peoples fled south, first to places like Homolovi. At that time, with reliable flows of water in the Little Colorado River, Homolovi seemed like a peaceful and abundant place to settle and farm. As with so many landscapes on Gaia, or Mother Earth, appearances can be deceiving. For years, and perhaps decades, the balance of nature prevailed. The new arrivals from the north built structures near the river and used irrigation ditches to water their corn and other crops. Then, similar to Superstorm Sandy flooding the subways of Lower Manhattan Island, New York, the formerly benign Little Colorado flooded much of ancient Homolovi. Without warning, the river became a torrent, liquefying the adobe dwellings and washing them away. When twentieth century archeologists dug in the area near the river, they determined that ancient Homolovi was flooded and partially destroyed at least twice. Whether repeated flooding or an intensifying drought led the ancient residents to abandon Homolovi is unknown. What Anglo archeologists concluded, however, is that the place was a ruin. In May 2011, when I again stopped to enjoy the solitude of Homolovi, some things had changed and some had not. Although still a unit of the Arizona State Park system, at their own expense, the Hopi Tribe now managed the park, including its museum and the campground. Among their first acts, the Hopi eradicated the word “ruins” from the park. This was an easy task, requiring only the painting-out or taping-over of the offending words. To some, it may seem insignificant to expunge the word “ruins” from Homolovi State Park. To the Hopi it was a sacred act, honoring their ancestors and other ancient dwellers of the area. Contemporary Southwest American Indians believe that the spirits of the ancients still dwell in the areas like Homolovi. “May the spirits be with you”, is the unspoken greeting of current tribe members. In the various legends of the Southwest, there is no other character as ubiquitous as Kokopelli, the flute playing minstrel and god of fertility. Both anecdotal and archeological evidence points to Kokopelli first appearing as petroglyphs on Hopi tribal lands. For that reason, I invited Plush Kokopelli to accompany me on my May 2013 visit to Homolovi State Park. 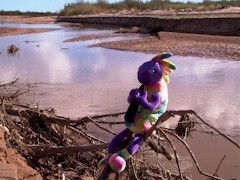 Upon arrival at Homolovi campground, Plush Kokopelli wanted to see the river. It was late afternoon, so I set up camp and told him that we could visit the river in the morning. As evening approached, I took still-camera shots of the setting sun. 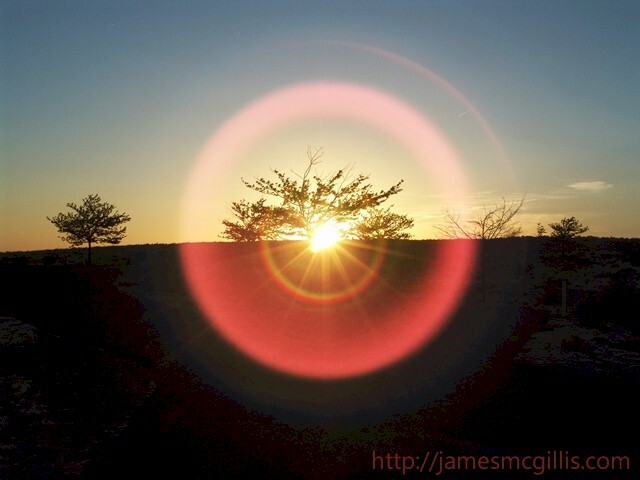 Unlike my 2008 visit, with its colorful skies, my 2013 sunset was clear and dry. The video shows the progression of the 2013 event, followed by the vivid colors of the 2008 sunset. Some may think it is strange or eccentric to travel with a Plush Kokopelli who is about the size of a two-year-old human, but I find him quite entertaining. For the most part, he minds his manners; plays his flute and watches the scenery go by as we travel. Still, when he wants something, he somehow makes it known. Early the next morning, I awoke to the visage of Plush Kokopelli staring at me. “OK, OK, we can go to the river right after breakfast”, I said. Viewing the Little Colorado River at Homolovi can be a risky thing. As you approach the Homolovi I trail, there stands a sign reading, “Danger Keep Out. 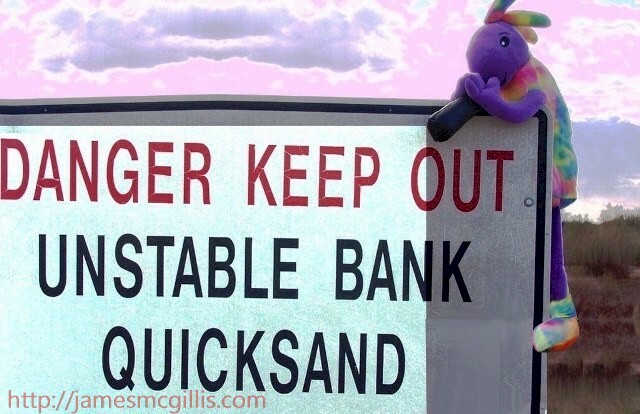 Unstable Bank, Quicksand, Strong Current”. 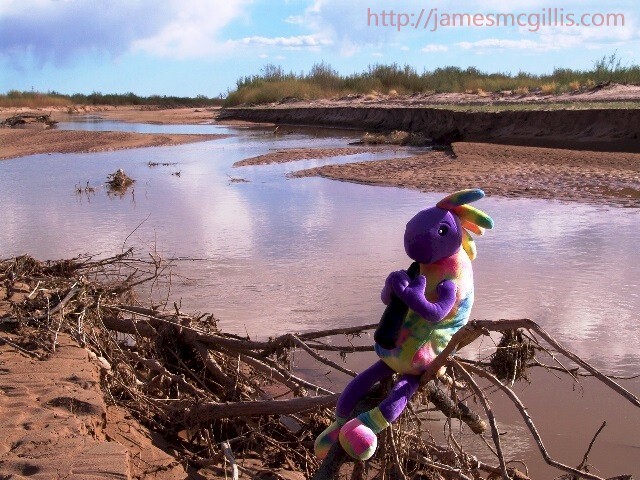 Plush Kokopelli was undaunted, urging me on past a washed out chain-link fence and then to the riverbank. From experience, I knew that the Little Colorado River no longer supported a perennial flow. When the snows of winter melted upstream, there was a rapid and intense flow for only a matter of weeks. By our visit in mid-May, the flow was sluggish and diminishing rapidly. Soon the running water would become pools of standing water surrounded by quicksand banks. Having experienced the quicksand during an earlier visit, I entreated Plush Kokopelli to stay on solid ground. Almost before I knew it, there he sat, on a snag overhanging the Little Colorado River. Like a parent scolding his child, I placed Plush Kokopelli on an old railroad tie that rested on dry land near the edge of the riverbed. When I offered to take his picture sitting on the railroad tie, Plush Kokopelli leaned forward and made a run for the river. If I had not captured his movement with my camera, few readers would believe my story. 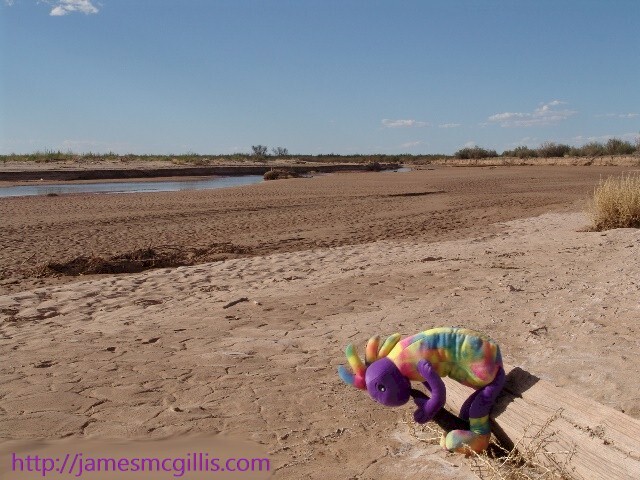 By then it was getting hot along the quicksand banks of the Little Colorado River, so I swept Plush Kokopelli up and carried him back to my truck. If you ever want proof that the spirits of the ancients still dwell at Homolovi, just invite your own Plush Kokopelli along for a stroll by the river. 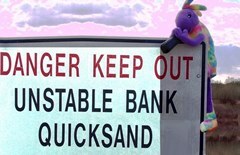 If you do, be prepared for his tricky behavior while visiting the unstable banks, quicksand and strong current of the Little Colorado River.